This lovely shoulder bag has travelled more than a few mighty miles to reach me in Australia with a delightful story attached. 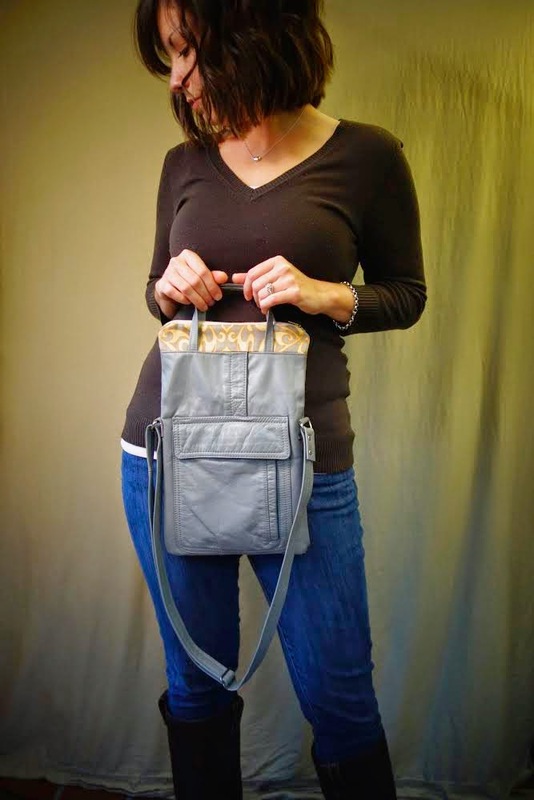 Claire Patterson makes bags, totes and accessories from recycled leather, selling via her business name June in July, formally Curl Girl Designs. Completely out of the blue, Claire offered to send me one of her beautiful bags because she loves this blog. Claire didn't ask me to review her brand in return, but seriously, how could I not? Not only is her gesture both kind and sincere, but her bags are pretty darn creative. 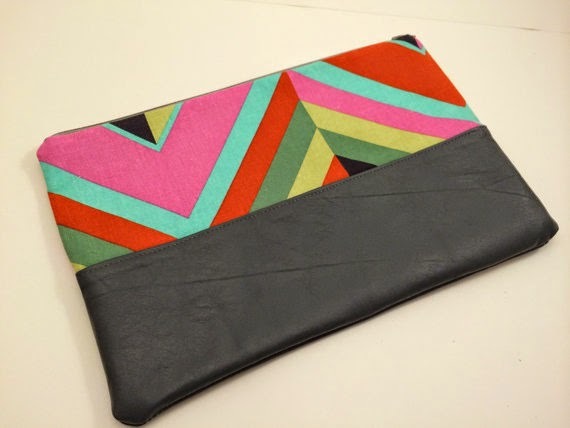 Claire uses a mix of colourful fabrics with the leather she chooses to work, adding a contemporary edge to her style. Also worth mentioning, Claire's prices are very reasonable too. I was born and raised in Columbus, Ohio and am still happy to call it home. I live with my super supportive and wonderful husband and my two year old munchkin, June. I am a lawyer by trade, but am currently trying to make a go of this handmade business. Q: How long have you been sewing for? I was raised around sewing. My grandmother taught home economics in the 1960s and my mom always made outfits and other crafts for my sister and I growing up. I starting sewing for myself in high school when I wanted to make a purse and things just blossomed from there. I started working with leather about seven years ago and it was really a game changer. Q: Why did you decide to start 'June in July'? I started just making purses and bags for myself, mostly because I couldn't find exactly what I wanted at the store. I never dreamed that people would want to buy them or that this would be my business. It's really inspiring that people love my bags as much as I do and want to support my creativity. Q: Where do you source your leather? 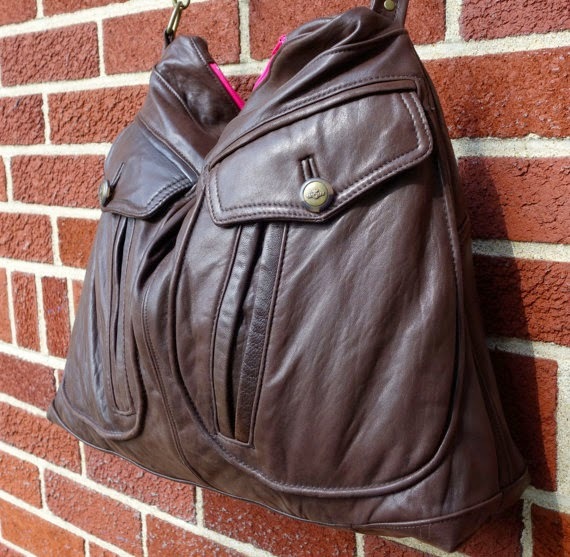 All of my leather is repurposed from vintage coats, pants and skirts. I buy most of it from second hand and consignment shops. Occasionally I do special orders where I transform sentimental leather pieces that are no longer used into bags so they can have a new life. Q: Is working with recycled material particularly important to you? If so, why? There is incredible detail in so many of these pieces that are cast aside and forgotten about. It honestly feels like we are doing the original leather crafters a disservice by not continuing to use these items that they have worked so hard to create. I love being able to give the leather a new purpose while at the same time saving us from waste. 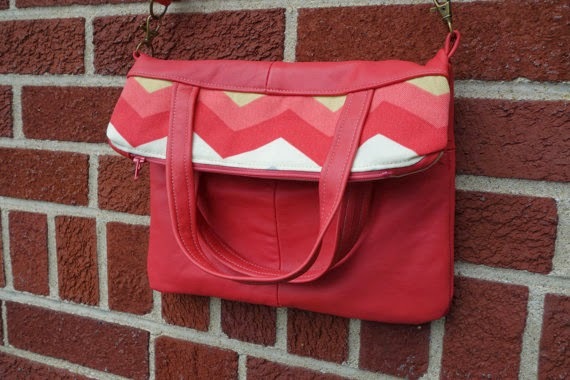 Q: Aside from Etsy, do you sell your bags anywhere else? I currently do most of my business on Etsy and sell in a few local shops and craft markets. My goal is to have an independent store on my personal website and hope to have that up and running in 2015. Q: What would you say is your greatest challenge working on your business? I have two major challenges. The first is my want-to-be-perfectionist personality. Working with recycled materials, it is difficult to have the exact size, shape or color available to perfectly fulfill my design vision. I spend a lot of time reworking ideas to make the most of the materials I have. My second major challenge is time. I have a two year old who is adorable, but also very very busy. As I'm sure any mother knows, there is a constant struggle of how to use my free time most effectively and efficiently. It is a struggle for me to make sewing and my business a priority. Once again Claire, thank you for my gorgeous bag. 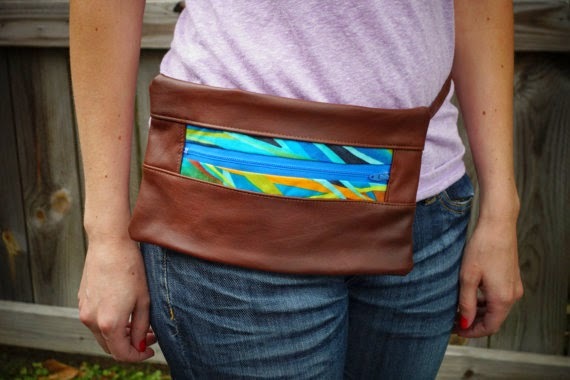 Keep up your great work and long may your recycled leather bag business flourish! You can follow Claire's adventures on Instagram, and shop her beautiful recycled creations on Etsy and her blog. Gorgeous bag, and love that she uses different materials! Good luck, Claire!